"Never has it been more important to reignite the dwindling flame of a two-state solution." 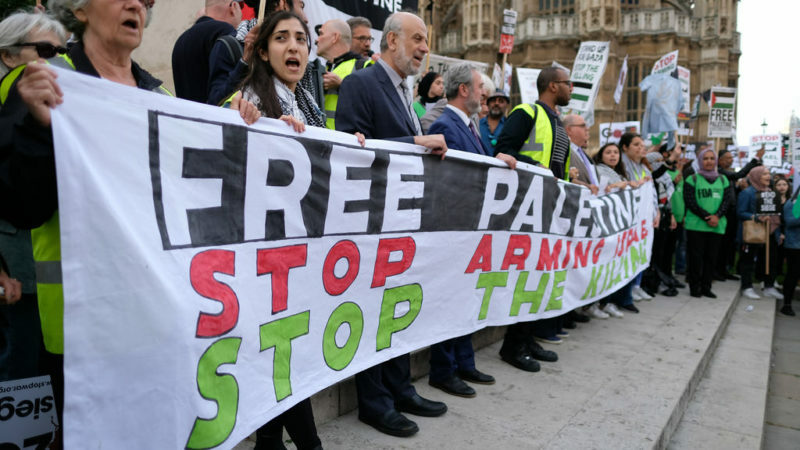 Campaigners have ramped up calls for the UK government to officially recognise the state of Palestine, following a right-wing win in the Israeli election. As of Wednesday afternoon, Benjamin Netanyahu’s hard-right Likud party was marginally ahead of Benny Gantz’s centrist Blue and White party, with 97% of all votes counted. Netanyahu – a key ally of Trump – has promised to annex illegal Israeli settlements in the West Bank is re-elected, further jeopardising hopes for a peace deal. He will likely form a coalition with other right-wing parties. Liberal Democrat MP Layla Moran – a potential leadership candidate and the first MP of Palestinian decent – recently introduced the Palestinian Statehood (Recognition) Bill. It would require the UK government to recognise the State of Palestine within three months of the Bill being passed. 137 countries officially recognise the state of Palestine, according to the Palestinian mission to the United Nations. Currently, the UK – like the US – only recognises the state of Israel, of the two. The UK would join the majority of countries if Moran’s Bill passed. It has support from Lib Dem, Labour, SNP, Plaid and Green MPs, including Vince Cable and Caroline Lucas. “The dead heat between Gantz and Netanyahu means uncertainty for Palestinians continues. “Should Netanyahu emerge as the leader, I hope the international community will speak out against the far right positions that he expressed during the election such as the annexation of Palestinian occupied territory. Such flagrant flouting of international law cannot and should not be tolerated. “Never has it been more important to reignite the dwindling flame of a two-state solution. The time has come for the UK to join the 70-plus [sic] states that have recognized the state of Palestine. “It now looks very likely that Benjamin Netanyahu will continue to lead Israel’s governing coalition. Given his clear reassertion during the election campaign that a Palestinian state would not be created, but also his specific stated intent to annex all of the illegal settlements in the West Bank, it is time for the UK government to move from words of condemnation to meaningful action. “This action should start with an immediate ban on goods from illegal settlements, and should also include the implementation of a two-way arms embargo with Israel until it ends its oppression of the Palestinian people. A new campaign was recently launched in the Labour party to ‘stand up for Palestine’. It is surely no coincidence that the outrageous ‘antisemitism’ campaign is being intensified at a time when pro-Palestinian progressive factions are making more and more of an impact on government in the UK and the US. Neither is it a coincidence that as the BDS movement grows ever stronger and more active, more effort is being made by the extreme-right of politics across the liberal western democracies to clamp down on democracy and terminate freedom of speech on behalf of Apartheid Israel. Over 50 states in the US have passed anti-BDS legislation which directly contravenes the First Amendment of the US Constitution. As we all know, the voice of progressive groups in the Jewish community which support the cause of the Palestinians are being censore by the mainstream media (MSM) across Europe and the US, at the same time as extremist right-wing voices of a Kahanist bent are given a public megaphone as if they, and the extreme non-Jewish right that supports a militant Israel, were the only voice of the global Jewish community. The mass falsehoods being promoted by the UK MSM amongst others is born out of the fear of a progressive, socially-active Labour government beginning to reverse decades of the damage done to the UK, firstly by unrestrained neoliberalism and then by the smoke-and-mirrors ‘economics’ of austerity. We should be in no doubt that if the Labour Leadership were able to wave a magic wand and make the antisemitism fraud go away overnight, within a very quick space of time there would be some other PR campaign being launched to try and stop Labour from forming a government. No other party has policies designed to reverse the unlimited access to UK government circles that has been gven to representatives of Apartheid Israel, and no other party has the truly radical platform of changes needed to make any impact at all on our deteriorating environment – the Green New Deal, People’s QE, etc. It is no coincidence that those factions determined to intensify the ‘antisemitism’ campaign against Labour are also those who most resist measures against climate change. Recognise Palestine – of course, but there are powerful pro-Israeli and pro-Netanyahu forces in the UK. It is clear that Israel runs the biggest concentration camp in the world and quickly becoming an Apartheid state with its new citizen laws. Expect it to interfere in British politics particularly if it looks as if Corbyn is likely to be PM. Already it appears that the genuine issue of anti-Semitism in the Labour Party has been weaponised by anti-Corbyn factions in the PLP and those outside in the various lobby groups purporting to represent the views of British Jew (population est. about 300,000 in the UK – mostly resident in Greater London and the Home Counties). I agree that Palestine should be recognised when it agrees to behave like a normal member of the community of nations.Women,s rights, no killing of gays people, no Jew hatred. All of the normal civilised stuff. Will you insist that those same conditions apply to Israel – an eye for an eye, a tooth for a tooth ? “Normal civilised stuff”. I totally agree. I have just helped fund the purchse of **gas masks** for a Palestinian primary school in Hebron. Needed against settler incursions, yes, but these are watched by. an Israeli army standing by. Stop attacking Israel, have free elections, women’s rights, gay rights, stop keeping Palestinians in the camps as political pawns and so much more.